Last week I receive a box of new goodies from Red Heart Yarns! When I opened the box and saw the Sassy Fabric I thought, “What am I going to do with this?” I’ve never used anything like it so of course it’s the first thing I grabbed to play with. I did a little searching and found a lot of scarf patterns. They’re pretty but I wanted to do something different. A little about the Sassy Fabric. You can visit Red Heart’s Website and see how it works but basically running along one end are small oval holes (this is where you insert your hook) and along the other side are scallops. Overall I liked the Sassy Fabric. It’s very light and has a lot of movement to it. While the Sassy Fabric is on the pricier side a little goes a long way for this project. Pattern and photographs copyrighted by KT and the Squid. You may NOT copy, share, change or sell the pattern itself. 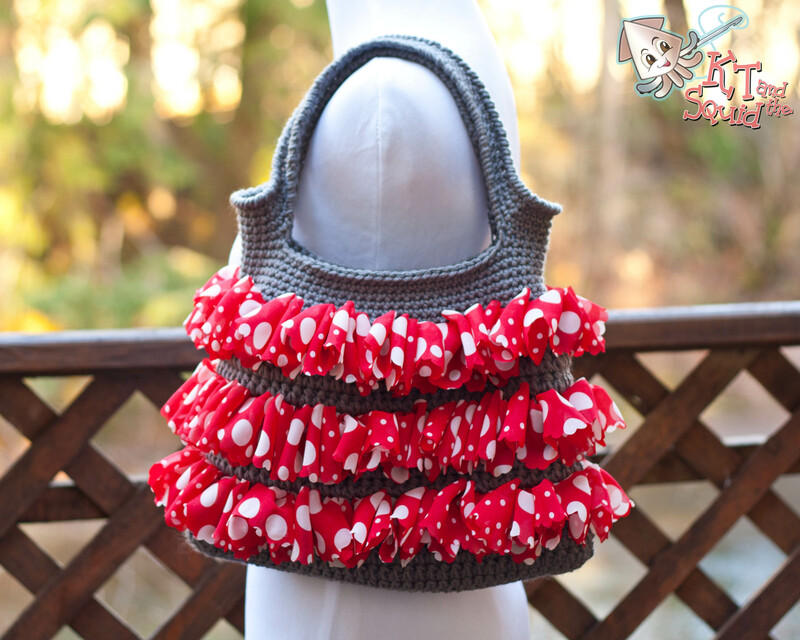 If you’d like to sell finished items from this pattern please do! Finished items belong to you and you may do what you wish with them. If you choose to sell them on Etsy please credit me (KT and the Squid) as the designer. *Gauge is not important for this project but if you’d like the exact measurements be sure to check your gauge. Finished bag is approx. 14” by 10” (laying flat, not including the handles). Forked Half Double Crochet (fk hdc):Yo, insert hook into 1st st indicated, pull up a loop, yo, insert hook into next st indicated, pull up a loop, yo, pull through 3 loops on hook, yo, pull through 3 remaining loops on hook. The bag will be worked as one piece in the round, at the end of each round you will join with a ss into the first st of the round. The ch 1 or 2 at the beginning of the round does not count as a st. Round 4-6 – Repeat round 3. *You will now add the Sassy Fabric ruffles. Repeat rounds 3-7 two more times. Lay the bag down flat, join where the line is pointing in the photo. **I have been given a skein of Sassy Fabric from Coats & Clark for this pattern. Even though I love the fabric, the generous donation from Coats & Clark has not biased my opinion of the product.